White Paper Published By: ActiveProspect, Inc.
On October 16, 2013, new FCC regulations will go into effect that introduce the requirement of prior express written consent of certain types of commercial phone calls and text messages to consumers. Among other things, the new rules require that marketers have prior express written consent to autodial or send pre-recorded messages to cell phones. These new Telephone Consumer Protection Act (TCP) rules will have broad implications. 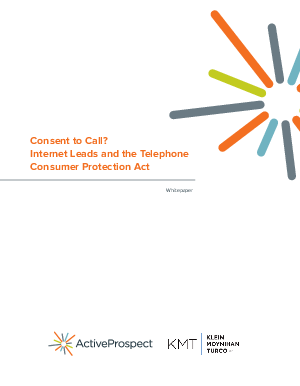 In this whitepaper, provided by the law firm of Klein Moynihan Turco LLP (KMT) and ActiveProspect, a marketing SaaS provider, offers a comprehensive overview of the legal aspects of the new TCPA regulations and simple solution to verify and store proof of consent for Internet leads in order to comply with the new regulations.